Now we all know that as much as we wish it were true, there is no "formula" to parenting. It would be so nice to be guaranteed some kind of "perfect" kids if we just followed a laid out plan. But, it's really not the case, inputs don't always equal outputs. This is an issue that I have wrestled with over the years. As I've processed it, God has helped me settle the matter in my heart. We just have to be obedient to the Lord, follow His leading and trust the rest to Him. All our children are unique and will make their own choices. We can get so stressed as parents thinking if we make one wrong decision, our kids will end up delinquents or worse not in relationship with us or the Lord. Well, what is "perfect" anyway? My goal is to raise children that love the Lord with all their heart, mind and soul. So here are some things to simplify the matter. Some things that I think are essential and then I just leave the rest to the Lord. I can't stress about it all. God wants us free to enjoy Him and enjoy our children and enjoy motherhood, not anxious micro-managers of our kids. 1. Be involved in a Bible believing church. Attend regularly, get to know the people there. Be accountable to them and let your children learn from the leaders there. 2. Love your children and set a good example to them. This means being nice and loving to your husband and children while trying your best to follow God's word and live a godly life. 3. If at all possible, homeschool your children or send them to Christian school with a Biblical worldview. If for some reason this is not an option, you will need to be more intentional with teaching them the Word and Bible memory. As they get older, have them take courses such as World View Academy to offset the worldly values taught in secular schools. 4. Have family devotions at least weekly and eat meals together as a family. During your family dinner meals pray and talk to each other about your day. Even secular studies show the benefit of the family dinner table. Well, that's it. I'm just going to relax and leave the rest to Lord. Dear Rebecca, it is a pleasure to read your posts. I guess by now I have read all of them. You leave an image of a very reasonable and well-organized person/ mother. I find it an inspiration. Most of your posts cover your experiences from after the times that you started blogging. By then you already had children in their teen years and late-teens. It would be interesting to read about your experiences from earlier years, like when you had a bunch of kids under seven or so, when they were too young to babysit the younger ones or to help more significantly around the house. Did you ever feel overwhelmed? How did you cope with that? Thanks for your comment Lina! That is a great idea. I will write a few posts in the next month or so that dealt with my life when I just had littles. 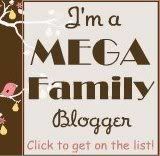 I started blogging in 2010 and at that time I had children 19,17,15,12,9,7,5,3, and 1 years old. You're right, things have changed and are still changing. Blessings to you! Dear Rebecca, I really enjoy reading your posts! I totally believe that good relationships with the members of our families can help to promote your self-esteem. Confidence and self-esteem will develop first from family relationships. Your children will be wonderful people for sure! You are an awesome mom!